Mar 28, 2014; Oklahoma City, OK, USA; Oklahoma City Thunder forward Serge Ibaka (9) drives to the basket against Sacramento Kings forward Reggie Evans (30) during the third quarter at Chesapeake Energy Arena. Looking at a box score is something anyone can do. Who lead my team in scoring? How’d we shoot from the field? And while that knowledge is useful, does it really earn you bonus points around the water cooler? That’s why I’m here. I’m bringing you the S.W.I.M: Statistics Worth Increased Media. Let Joe from accounting regurgitate what he heard on the way in this morning; you’re better than that. Use these nuggets to gain a unique perspective about last night’s Thunder/Kings game. For the second time in 2.5 months, Kevin Durant attempted fewer than 15 shots. He is averaging 27.5 points on 82.6% shooting from the field, 85.7% from distance, and 100% from the free throw line in those games. It wasn’t until his fifth season in the league until that Durant averaged three assists, but he now has four streaks of at least five consecutive games with six-plus dimes in the last year. The last time Russell Westbrook was active for a victory and failed to make a three pointer was December 19th. 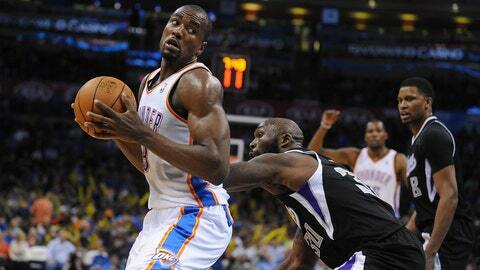 Serge Ibaka attempted just six shots in 30 minutes of action. Oklahoma City has not won a game in which their paint protector took fewer than six shots in at least 30 minutes of game time since February 2, 2011. For the first time as a member of the Thunder and first time since January 29th, Caron Butler managed at least three assists and three rebounds. For the 12th time in 12 games since the New Year, the Thunder won when Jeremy Lamb scored at least ten points. Ben McLemore made five of his six free throws in this game, quite the change after not earning a trip to the stripe in 17 days. Sacramento fell to 0-9 when Travis Outlaw plays at least 15 minutes and makes multiple three pointers this season. Reggie Evans matched his March high with a AS (assist plus steal) total of three. The Kings haven’t won a game in which DeMarcus Cousins rebound total was at least as great as his point total since November 21st, a stretch that was extended to ten straight games tonight. Three members of the Kings bench account for 31 rebounds while the 11 Thunder players not names Serge Ibaka totaled 30 boards.